Discus Paradise is proud to offer Stendker Discus. They come directly from the farm of Mr. Stendker itself. 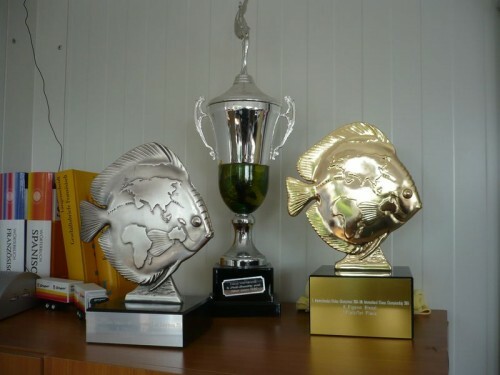 Since 1965, with its high reputation, Mr. Stendker is now the largest producer of high quality Discus in Europe and probably in the world. Discus Stendker is distinguished by its size, which often exceed 7 inches with a perfectly round shape. Its robust body and grace impress more than one! 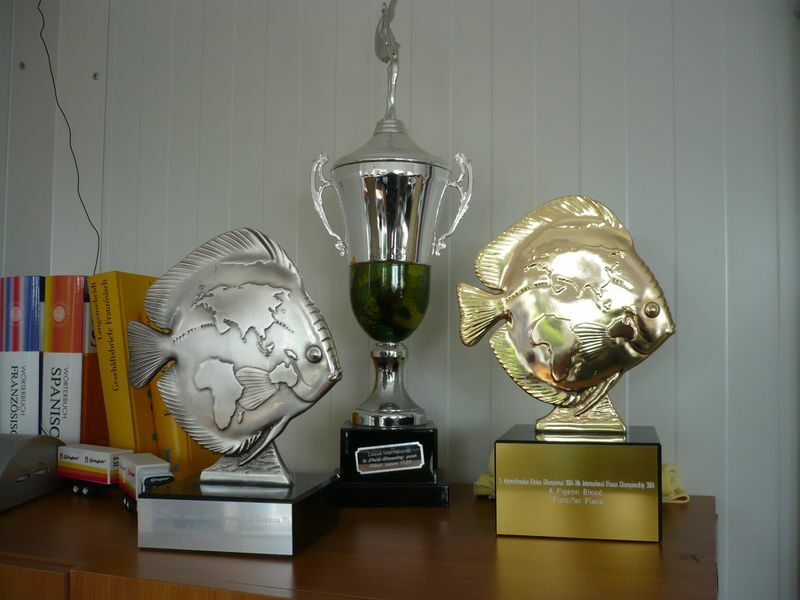 Our Discus won many competitions around the world, the most famous, the world championship of Duisburg. Mr. Stendker is now invited as a judge and no longer involved in concourts. 1st place in the Red Turquoise category. 1st and 2nd place in Pigeon Blood category. Best Bred in Germany, the number 1 country of Discus! 2nd place in the GRADE Pigeon Blood. Also won numerous competes in Europe. Much easier to keep than other Discus. They are obust and resistant with a very good immune system are high because They are raised without antibiotics. They support up to 100 mg / l nitrate and and grow normally. No need to clean the tank every day. They grow quickly and defect free as they are raised naturally therefore they will lack nothing when they will be in your aquarium. They are not fearful because they are raised using traditional methods. Their behavior is calm, with fewer combat. They come from a farm with a careful selection of the size of perspective, color, shape but also behavior to produce beautiful calm fish, no social and fearful. No disease because they come directly from the farm in Germany and will not in any aquarium before you. They normally grow because they are bred in a natural way, with natural food. No need to reverse osmosis device, they are raised in tap water. They can be kept from 2.5 “in a planted aquarium with other fish. 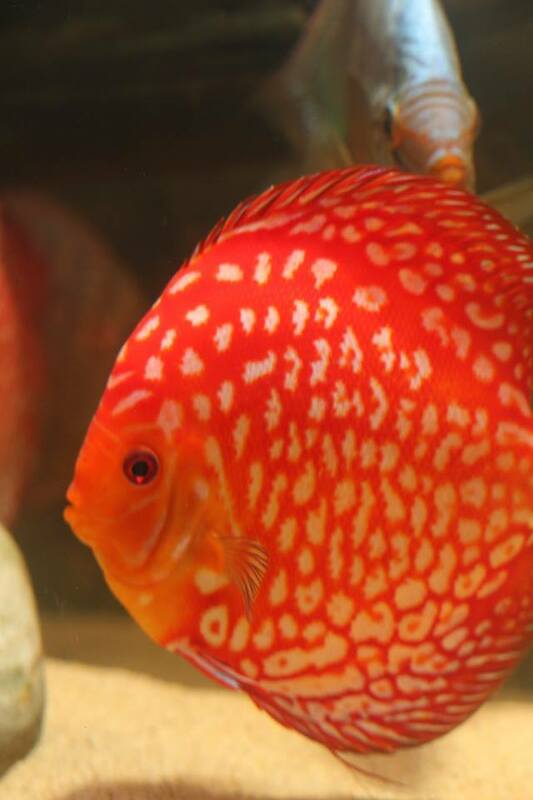 Forget the complications of maintaining Discus that require pure and fresh water that is often difficult to obtain and maintain in your aquarium. 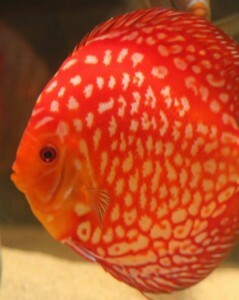 A lot of Discus who will not have this water will not grow normally instead of our German Discus. Indeed, our German Discus are raised in a moderately hard water (GH 15, KH 8, pH 7, 800μS, 50-150mg / l nitrate) that you will have no problem to have. Tap water simply following your area, no reverse osmosis besion. By concern for the environment and water are paid in Germany, rearing Mr. Stendker operates with relatively low water changes. This causes a high nitrate levels of the water in which they are raised and made very robust fish. During our visit to Germany, Mr. Stendker tested front of us the rate of nitrate who was almost 100mg / l. For over 40 years, Mr. Stendker selection work made its Discus are genetically capable of supporting such nitrate levels without any problems. They reproduce successfully without problems with same color of the parents. 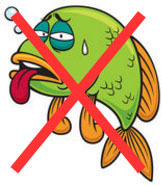 - Very many possible diseases because you buy them in not always healthy aquarium without long quarantine. - Fragile because raised with antibiotic, very bad immune system. - Do not normally grow because raised with non-natural products that you do not have. - You need to buy a reverse osmosis device, they do not like in tap water. - They can not stand more than 20mg/l nitrate to grow normally. - They need an empty aquarium with no plants and no other fish until they do 4“. - You must clean the aquarium of their excrement every day. - They need water change of 20% per day to maintain low nitrates and grow normally. - They are fearful and nervous with fighting one another. - They are often infertile or give non-viable babies or different color of the parents.